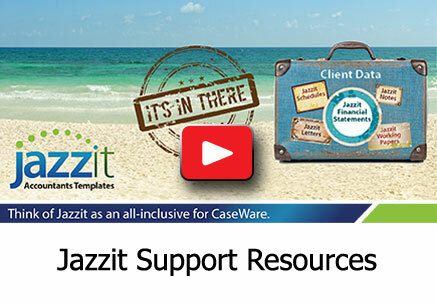 As a Jazzit client, you have a range of resources available when looking for help. Jazzit Support Centre - Your Jazzit Support Website offers a wide range of Technical Bulletins and Instructional Videos for both Administrators and Preparers. Jazzit YouTube Channel - Provides a number of instructional videos. Jazzit Resource Centres (KLIB and FRMLIB) - There are two reference guides included in the Resource Centres. These are available on the CaseWare Document Manager. Jazzit Community - An online community where you can communicate with us or other Jazzit clients. You can seek advice for resolving an issue, ask questions and post ideas.